Organizations like National Opera are usually not early adopters of social media, but we wanted to change this. Soon after the very successful launch of the @NationaOpera accounts on twitter and facebook, we decided to go one step further. For the promotion of Nabucco opera, we ran a very simple yet engaging twitter contest. During the contest we encouraged the audience to tweet about Nabucco, using the hashtag #nabucco. Five of them will then win a double invitation to the theatre. What happened was simply amazing. We received hundreds of tweets for #nabucco as the users generated a positive social media buzz around the show. 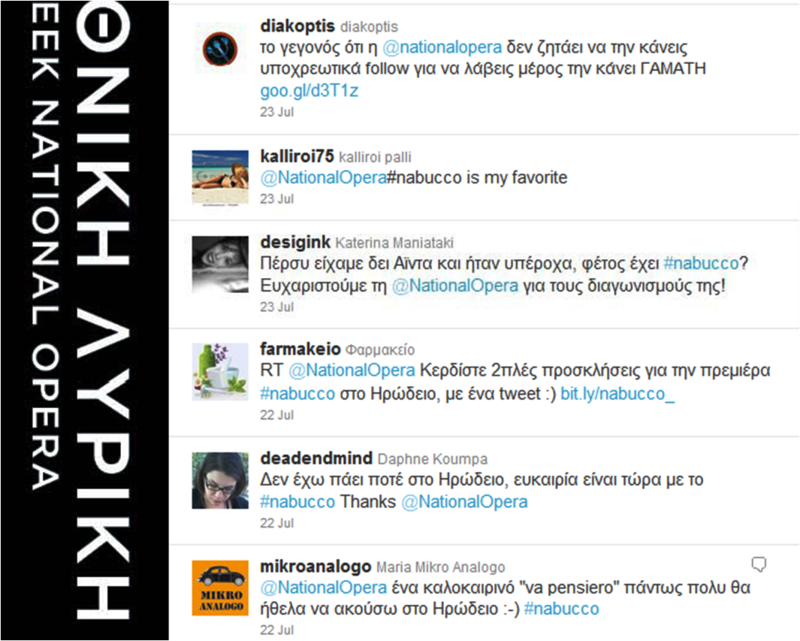 During the last week of July 2011 #nabucco became a trending topic among greek twitter users. People kept tweeting and sharing their enthusiasm about it for days after the contest ended. The National Opera of Greece goes digital!